Who we are - North Coast Music was founded in 1991. Although our product offerings and services have expanded over the years, North Coast Music has always specialized in providing the materials necessary for the restoration and preservation of vintage Vox amplifiers. Vox Amplification was so impressed with our efforts that they extended an exclusive manufacturing license to North Coast Music that would allow us to reproduce long discontinued Vox parts such as logos, handles, cabinets and trolleys. We are proud to be a small business - In a world full of big box retailers and web sites, North Coast Music is a "mom and pop" shop with only three employees. Product quality is a passion at North Coast Music. Due to our concerns for impeccable quality and customer satisfaction, every guitar and amplifier sold by North Coast Music is inspected and tested prior to shipment. The owners of North Coast Music will not ship a product that they would not be willing to purchase themselves. When you email North Coast Music, the response you will receive will come directly from one of the owners. Returns and Satisfaction Policies - Our returns policies are stated in simple terms and allow a 48 hour inspection policy for most items sold at North Coast Music. Click here to read our Returns and Satisfaction Policies. Vox Parts Manufactured at North Coast Music - Take a look at the story behind several of the Vox parts that North Coast Music manufactures under license from Vox Amplification. Prior to North Coast Music arriving on the scene, replacement parts for old Vox amplifiers were all but non-existant. After receiving the blessing from Vox Amplification in the UK, North Coast Music dedicated itself to making these hard to find parts available again. A good example of the effort required to produce these parts is the Vox trolley hand wheel, shown at right. The Vox hand wheel required the development of a series of stamping tools, shown below. Only after we invested thousands of dollars in steel stamping dies could the first reissue Vox hand wheels be produced. Vox "Egg" Footswitch from North Coast Music - After Marshall ended their manufacturing partnership with Vox in 2004, North Coast purchased the sand cast mold that Marshall used to produce the "egg" foot switch for the AC30TB and AC30TBX amplifiers. North Coast Music continues to produce the single button "Egg" foot switch from this tooling. It includes the correct hammertone gray finish and rubber tread base. Brass Vents For Vox Amplifiers from North Coast Music - Many Vox amps manufactured before 1964 featured "press in" brass vents. Many of these vents went AWOL over the years. We took an original vent from a fawn 1961 Vox AC-15 to a high end metal stamping fabricator for evaluation. We hoped that we could reproduce an exact copy of these vents and offer them exclusively at North Coast Music. Our original part was laser scanned to get an exact dimensional profile of the vent. The exact thickness of the original vent was carefully measured as well. From these measurements a four piece set of steel stamping tooling costing thousands of dollars was developed that would allow North Coast Music to precisely reproduce the original Vox vent. This brass vent would only be available at North Coast Music. In recent years, knock off Chinese brass vents have appeared at various part suppliers. As one might expect, these Chinese parts do not offer the quality or accuracy of the North Coast Music vent. 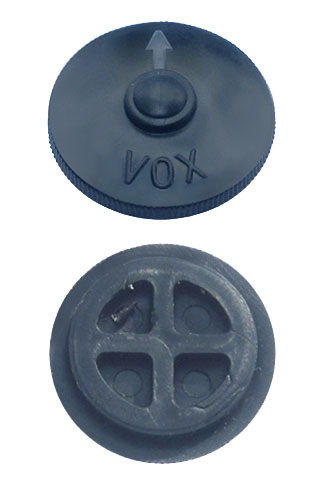 Injection Molded Plastic Parts for Vox Amplifiers Manufactured by North Coast Music - Vox amps included an assortment of plastic hardware and trim parts that were produced using injection molds. Injection molds are usually made from steel and have precision machined "cavities" that form the features of the desired part. Molten plastic is injected into these cavities. After being cooled by water lines inside the mold, pneumatically operated pins eject the finished product. It is not unusual for an injection mold to cost ten thousand dollars or more to produce. North Coast Music was fortunate to locate and purchase the original injection mold from Rean of London that was used to produce the corners found on 1960's era Vox amplifiers. 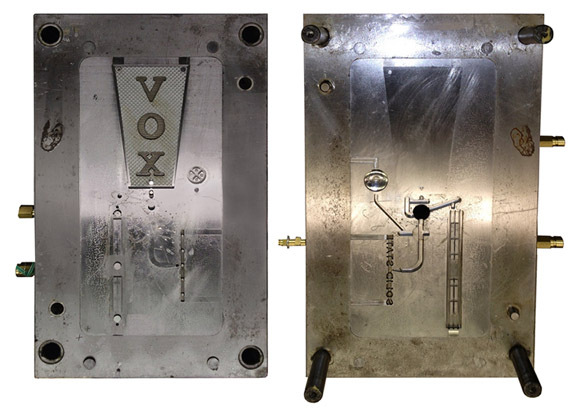 This mold produced both the one and two pin corners used by Vox from 1963 through 2004. The picture at left shows two pairs of one and two pin corners still on their "tree" as they come out of the mold at North Coast Music. We also purchased the original injection mold used to produce the Vox handle for Thomas Organ. PHC (Philadelphia Handle Company) of Camden NJ built this handle mold for Thomas Organ in 1965 (see photo below). With so many more styles of Vox plastic spares out of production, North Coast Music decided that we would develop our own injection molds to reproduce these parts. Initially, North Coast developed injection tooling to mold the horizontal and vertical name plates for Thomas Vox amps. Then we built tooling to reproduce eleven styles of British style "model flags." Next came the small horizontal Vox logo used on the T.60 amplifier and Continental organs. Most recently, North Coast Music built a "family" injection mold that would produce the large UK "pie" name plate, the slender Vox logo air vent, the "solid state" logo used on US Vox amps and the voltage selector knob used on early British Vox amps (see these parts immediately above). A valve in the center of the mold directs the molten plastic to the appropriate cavity. The steel injection mold for these four parts is seen at left. The mold weighs over 700 pounds and cost North Coast Music over $12,000 to build. Chrome Stands and Trolleys for Vox Amplifiers Manufactured by North Coast Music - Vox stepped up the appearance and function of their AC-30 in 1962 when they introduced a matching chrome plated amp rigid stand. Over time, Vox introduced swivel trolleys for their AC-30, AC-50 and AC-100 speaker cabinets. The stands sold well but over time proved to be problematic to produce. Vox phased out stands and trolleys in the early 1970s due to escalating costs of manufacture and quality control issues. North Coast Music revived Vox stands and trolleys in the mid 1990s. To start the process, North Coast Music had to locate and purchase original 1960s era trolleys and stands to use as a manufacturing reference. Each stand was then carefully measured and documented on a half scale CAD blueprint. These blueprints were taken to a machine shop to have bending dies and welding fixtures fabricated. 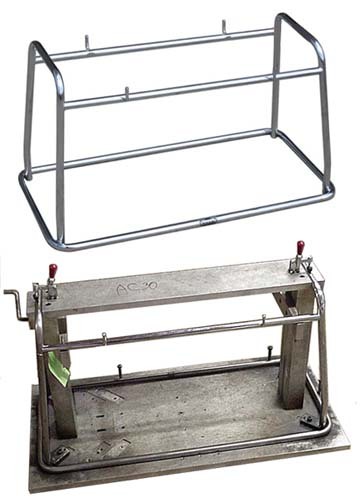 The welding fixture for the AC-30 rigid stand is shown at lower right. It cost North Coast Music about $3000 per stand model to get just to this point. Next a tubular fabrication shop would cut, form and weld the stand together using seamless steel tubing. After fabrication was completed, the stands were transported to a plater for a chrome finish. Here's a fun fact. North Coast Music fabricated all of the VS-30 (AC-30) and VS-50 (AC-15) rigid amp stands sold by Vox throughout the world since 1997. Regardless of which online or brick and mortar music retailer you purchased a Vox AC-30 or AC-50 rigid stand, it was originally built by North Coast Music.